London Marylebone station is the gateway to up-and-coming commuter hotspots throughout Buckinghamshire and beyond. Commuters on this line can enjoy living in a picture-perfect village setting, with swift journey times to and from the capital. Located in the highly desirable village of Long Crendon in Buckinghamshire, Spitfire Bespoke Homes’ exclusive development Greenings boasts a new thatched show home and a commute less than 60 minutes to the capital. Commuters benefit from the nearby Haddenham and Thame Parkway Station, which offers regular train services into London Marylebone in approximately 50 minutes. Long Crendon offers buyers a chance to live in a rich historical village, without compromising on excellent transport links. Effortlessly blending into the surrounding countryside, Greenings comprises a collection of 41 luxurious new homes. Each has been designed with this quintessential village setting in mind, featuring an eclectic mix of architectural styles including a charming thatched cottage. 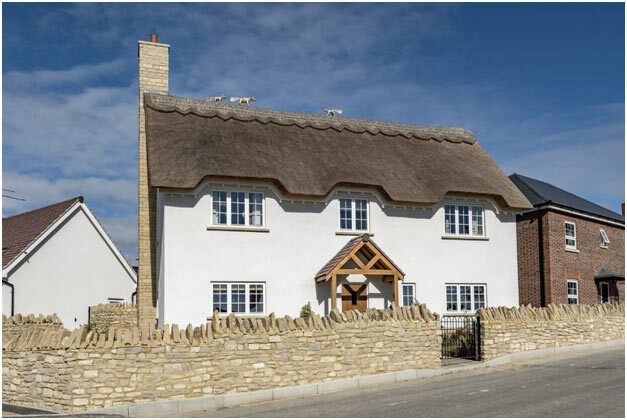 The four-bedroom Haywood show home is complete with a traditional thatched roof and a double garage. Upon entrance, the impressive hallway features a bespoke feature staircase. 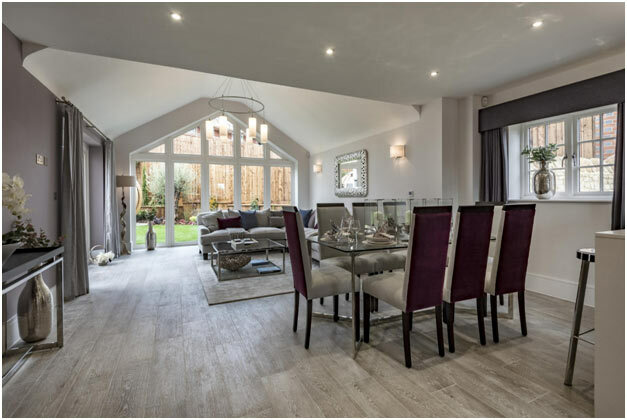 The heart of the home is created by the large open plan kitchen, dining and family area featuring stylish quartz worktops and glass splash backs as well as a range of exquisite integrated appliances. Ideal for relaxing, the separate living room is spacious with French double doors that open onto the rear garden. 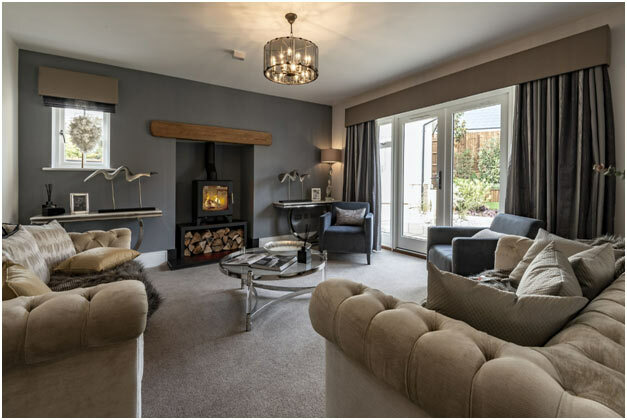 A traditional log burner fireplace is located in the centre of the living room to warm up the winter months. There is a study providing a private space perfect for working from home. Upstairs, the large master suite is complete with a dressing room with bespoke fitted wardrobes, connecting to the private en suite bathroom. An en suite and fitted wardrobes are also included with bedroom two. Completing the first floor are bedrooms three and four, both of which are served by the family bathroom. White contemporary sanitary ware by Villeroy&Boch with polished chrome fittings by Hansgrohe are fitted to all bathrooms and en suites as a high specification standard. Long Crendon is set between the university city of Oxford and the charming town of Aylesbury. Benefitting from a number of local shops, the village includes a coffee shop, newsagent and a post office. Larger supermarket chains, Sainsbury’s and Waitrose, are just three miles south in Thame. Oxford is just 16 miles away and presents many independent shops and shopping centres for residents to enjoy some retail therapy. Long Crendon boasts excellent transport connections. Haddenham and Thame Parkway Station provides regular train services to High Wycombe, Oxford, London and Birmingham. The M40 offers convenient travel to London and the south east, and northwards to the Midlands, while the M4 places the south west within easy reach. Prices at Greenings start from £435,000. For more information please visit www.spitfirepg.co.ukcontact the selling agent 01844 208 918.